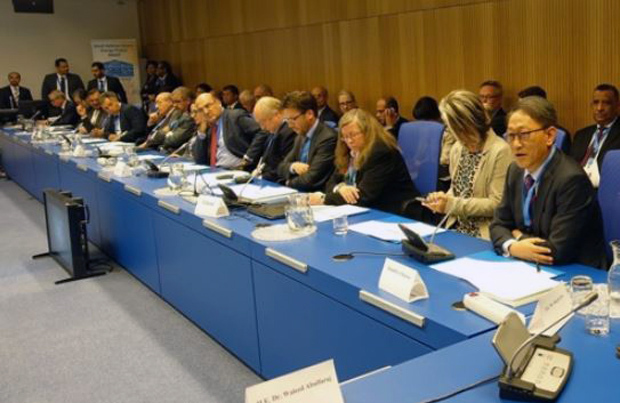 The Korea Atomic Energy Research Institute said Tuesday that it promoted its SMART reactor for export to third countries at the ongoing assembly of the international nuclear watchdog in Vienna. The promotion was made as a subsidiary event at the headquarters of the International Atomic Energy Agency the previous day, with 22 Asian, African and Mideast countries attending, a KAERI official said. During the event, KAERI introduced Saudi Arabia's nuclear reactor project, in which it is taking part, and its "SMART Partnership" with the Mideast country, the official said. SMART stands for System-integrated Modular Advanced Reactor. The institute began the SMART development in 1997 and obtained international approval for its standard design in 2012, securing a foothold for commercialization. The KAERI-designed SMART is a small-scale reactor capable of generating up to 110 megawatts of electricity that can meet the power demands of a small city with a population of about 100,000. In 2015, South Korea and Saudi Arabia signed a memorandum of understanding on the setup of two SMART reactors in the Middle East country.